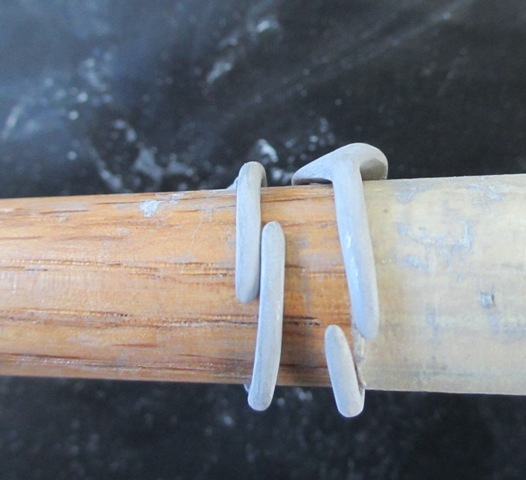 Working on greenware (filing, sanding, carving) is an essential part of precious metal clay processing. And, of course, I had high expectations from PMC Pro, advertised as an extra strong precious metal clay. 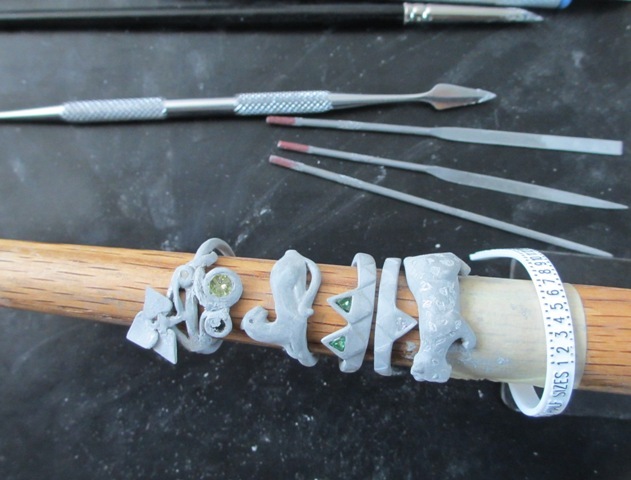 Therefore my first Pro-project has been quite ambitious: making a series of rings in different styles. Since it’s my first Pro experience and I am still unsure about the size and the shrinkage, I made two of the rings open – as shown on the picture on the right. The open rings turned out to be the trickiest during sanding, because they are quite springy. The wooden mandrel turned out to be quite useful not only during shaping, but also as a support during sanding. Three files out of my 12-piece file needle set have been dedicated to Pro and marked with a nail varnish (the Russian way of permanent marking, used for different kind of metal tools). And, of course a separate slip jar is necessary. There is no need to dedicate other, better cleanable tools, such as the mandrel or the carving tools. The most important conclusion from working with PMC Pro greenware: yes, this clay is definitely stronger than the other kinds of precious metal clay, but it is impossible to avoid breakage completely. Especially at the critical points, such as connections between different elements. And the step-by-step approach – make an element, let it dry, connect it to another element – might not be the best one. The bonding between dry elements requires a lot of slip and patience. It took me several days to process the whole series. So it’s an illusion, if you believe that PMC Pro should be faster in processing. On the contrary, it dries slower and really needs some help from the hair-dryer. Files and sanding paper get clogged when the clay is just a bit moist, and it is even more true for PMC Pro than, for instance, for Art Clay Silver, which is a fast-drying clay. Now the most exciting step – the firing. To be continued.